Women held a paramount role during the American Civil War. Back in the 1850s the government did not provide for the military the same way they do now and it was often up to the women to provide clothing and bedding for the soldiers. This experience alone is said to have been one of the largest forces of confidence amongst women and what propelled the push for the right to vote! Women’s role within the war was not always received well and there were many that were not happy with their commercial patriotism which was shown through the sale of their civil war quilts at local fairs. However as times were dire and money was needed for war supplies, women continued to make quilts for sale. Despite the money that was brought in from the quilts as the war continued it soon became obvious that there was a desperate need for bedding and clothing for all the soldiers. 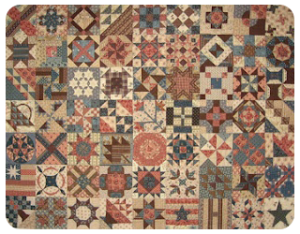 Many quilts were made for both fundraising and for the soldiers’ bedding during the Civil War. A great deal of commemorative quilts were made after the war as well. The soldiers’ quilts were generally made with basic fabrics and very simple block patterns. Time was always an issue, so the faster the quilts could be made the better. 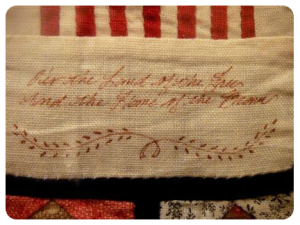 Often the quilter would place some inspiring words in one of the blocks to give the soldier some encouragement while they were at war. 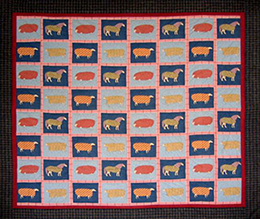 Many quilts were made from the most basic, but available fabrics. As time went on, women would often cut up two existing bed quilts and re-sew them into three or four cot quilts! Money became more scarce and women had to raise money through selling their quilts at fairs in order to afford the material for their soldier’s quilts. However as the war progressed and money began to tighten even more the women did not have enough fabrics, materials or money to make the soldiers quilts. It has been said that a yard of calico went for around $25 towards the end of the war! Even these days that is a unreasonable amount to pay for Calico! 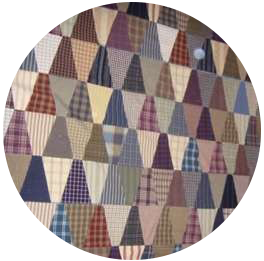 Men’s clothing, old blackets, feed and fertilizer sacks, wool weave, old uniforms, suits, coats, twill flannel, sleeves, pocket-flaps and pants legs were all used to make quilts! Sometimes they used the wardrobes of the men who had died fighting in the war to make blankets for other soldiers. Many of the quilts did not have batting as it was scarce and often could not be found. The backing was generally made out of old fertiliser or feed sacks. These types of quilts were often very roughly put together, with large chick track stitching. Their purpose was solely practical and functional with the aim to keep someone warm, and there is no beauty or skill in the finished masterpiece. Many soldiers were buried in their quilts and as a result very few original civil war quilts have survived. As most of the quilts were made hastily and were poorly constructed, many did not survive the war. 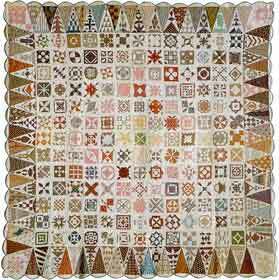 By the time the war ended it is estimated that over 250,000 quilts had been made for the union soldiers. You might be more interested in making a quilt much like the women made for the soldiers in the Civil War. These were often done with a single block pattern. You could even make the quilt 7’4″ by 4′, the size of a soldier’s cot. This size makes a great wall-hanging quilt and is an excellent conversation piece for your quilters circle.